Welcome back to Austin for SXSW 2017!! We are excited to show off how we can shine your brand anywhere you like with lasers, ride your VIP’s on one of the Bike Zoo’s Giant one-of-a-kind Animals or Fly your brand 100 feet in the air with aerial balloons! A lot of event planners can brag about creating from the ground up but at RajiWorld we can even offer you world-class, beautiful and professional mermaids to start the party underground, not to mention our taste in music!!! 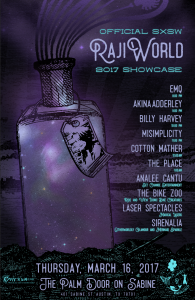 Lineup: The Place 1:00 AM, Cotton Mather 12:00 AM, Misimplicity 11:00 AM, Billy Harvey 10:00 AM, Akina Adderley & The Vintage Playboys 9:00 AM, EMQ 8:00 AM with set change harp by Analee Cantu, magic in the trees and on the building with Laser Spectacles, rides and photos with the one and only Bike Zoo and landlocked play with the Sirenalia Mermaids!! We will have complimentary temporary Manifestation tattoos from our sponsor Conscious Ink. 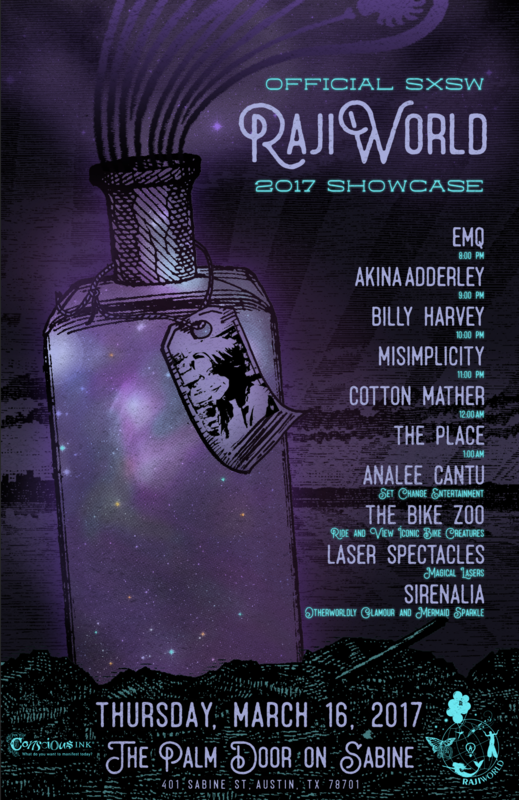 Beyond the showcase RajiWorld clients will be playing “Second Stage” hotel stages all over town, check here for updates and Chris Stamey will be presenting the BIG STAR’S THIRD + FRIENDS show as well as the film! A special orchestrated performance of selections from both Big Star’s legendary Third album and their earlier releases, featuring an all-star cast, including members of Austin’s own Tosca Strings. Preceded by sets by three superb singer/songwriters.